CHRIS WHITE, AN aide to Congressman Maurice Hinchey, read a letter from Hinchey in opposition of the proposed mushroom plant in front of the Mamakating Planning Board Thursday. Sitting behind White was town planner Alan Sorensen, engineer Jim O'Rourke, Planning Board Chair John Piazza, & attorney Langdon Chapman. 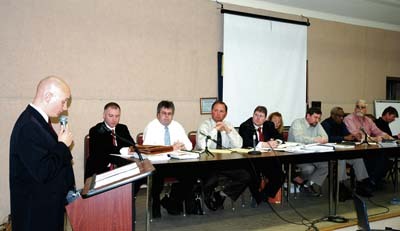 WURTSBORO  May 2, 2006  In what could be the last public hearing on the proposed mushroom factory by the Yukiguni Maitake Manufacturing Corporation of America in front of the Town of Mamakating Planning Board, opponents and supporters lined up amidst a tense atmosphere Thursday evening at the town hall in Wurtsboro. The plan, which has caused enormous controversy over the last several years  including two lawsuits and countless divisive words  brought agitated union workers into the fold this time. Last Thursdays public hearing was for the companys application for site plan approval and a special use permit for its 80-foot-high and 925,000-square-foot plant. The hearing followed a particularly tense meeting by the towns Zoning Board of Appeals, where the board granted the company key variances for its project. At that meeting, Chairman Jim Barnett angrily shouted at plant opponents as they challenged him before the voting took place. On Thursday, the planning board itself was quite the calm scene, as union members from out of town and, in many cases, from outside the county attacked opponents of the plant. Hurling personal insults at local residents and challenging an aide of United States Congressman Maurice Hinchey, they caused a New York State Trooper to respond and oversee the end of the hearing. Hinchey has opposed the plant due to a host of environmental concerns including the plants proposed water usage which has been estimated to reach 425,000 gallons of water on the hottest days and up to 300,000 gallons on the coolest days. Up to 308,000 gallons have been estimated to be released into the air. In a statement read by Hincheys aide, Chris White, his concern for the negative impacts on the towns scenic and historical resources and potential degradation of the quality of life have not been mitigated since he began writing letters to the board in 2003. He said an independent and comprehensive hydrological and ecological study should have been undertaken. In addition, the proper water permitting dockets were never sought by the applicant from the Delaware River Basin Commission. Hincheys letter described the Shawangunk Ridge as a regional and national asset. The view from the ridge could be negatively impacted by the large plant. The Delaware and Hudson Canal and D&H Linear Park are important historical and recreational resources that border the proposed facility, he wrote. Later, while White was leaving the building, two hostile union laborers confronted him and yelled in his face. In addition, two speakers were loudly booed by the union workers as they spoke and even afterwards. At first, when one Orange County laborer began hurling personal insults at plant opponents during his public comment, he was not stopped by Planning Board Chairman John Piazza. An opponent to the plant responded, and another Orange County union laborer shouted back at the top of his lungs for her to shut up. Eventually, Piazza attempted to quiet the union speaker, but he continued. Dave Clouser, a professional engineer and surveyor hired by the Basha Kill Area Association, presented an 11-page statement where he pinpointed some of the information the applicant has failed to provide, as well as permits they still need to obtain. For example, he said they will need a wetlands disturbance permit from the New York State Department of Environmental Conservation and a permit from the Delaware River Basin Commission. He, like several others at the hearing, called for elevation drawings from the plant. As recently as last month, even town planner Alan Sorensen called for the elevation drawings for the plant. Opponents have been requesting them since the beginning of the review process. Yukiguni is also required to present an odor management and visual impact plan as required by the town planning boards own findings statement and the county planning department. Town resident and former candidate for town council Richard Morris gave one of the most detailed presentations of the night when he argued against the possible negative health impacts from the vapor emissions of the plant. Those emissions could contribute to an increase in heavy fogging, as documented in areas like Tennessee, he said. Also, the vapors could cause the deadly Legionnaires Disease. He backed up his claims with analysis by a Harvard University professor and submitted the documents to the planning board. He said he had previously informed the board of those findings, but they failed to act on them. He said the company has failed to provide any information that its cooling towers will not increase the existing fog problem in the town. In a study of 129 outbreaks of Legionnaires Disease worldwide, 26 percent were linked to cooling towers, he stated, including the nearby Ellenville Hospital. Summitville resident Eileen Weil said the project has already had a negative and divisive impact on the community. On top of that, key documents about the plant are missing from the towns files, she said. She said the public hearing was irresponsible since the plans are not yet complete. She also did not believe the companys proposed job figures of 200 employees, based on the towns prior experience with large companies. For example, Kohls employed 289 workers last year. That is less than one-third the number which was promised to the town when the company presented its plans to build the largest building at the time in the town. Another subject that plant opponents have been jumping on for at least two years is the balloon test which measured the visual impact of the plant. They said the test was not done in public and therefore cannot be trusted. Town resident Andrew Weil called for another balloon test on Thursday. One woman noted that Sullivan County Planning Commissioner William Pammer recommended denial of the proposed plant in the countys 239 review for, among other issues, not fitting in with the towns master plan. The factory would be the tallest in the county, she said. Despite the aforementioned fracas, there were several union members who were more peaceful and stated their support of the plan with calm reason. Two county union members said the lack of work in the area caused them and others to travel outside the county for work. That is why many of the countys young are leaving the area, one pointed out. Another said the plant would help lower taxes in the town. Sullivan County Partnership for Economic Development President Marc Baez said the plant would total $1.2 million in tax rateables. Afterwards, Piazza would not comment on whether the board would be seeking further documentation from the applicant. He estimated that it would take about a month to review the comments from the public. Representatives from Yukiguni said they have submitted all the necessary information, as required by the town.